Can I recover my call history lost from iDevice after updating to iOS 8.4? After you have updated your iPhone or iPad to the latest iOS 8.4 only to find all your call history disappeared, you can use iFonebox to selectively recover the lost call history. If you are business people, you probably would get dozens of phone calls a day and most of them are from your customers, cooperators, insurance agent, or even your investor. It would be a disaster if you lost all the call history when you need to call them back, especially when you haven’t got time to save them and add as contacts. Unreasonable data loss such as call history loss is not a particular problem for any individual version iOS, you will be probably hit by call history loss or any other data loss even with the latest iOS 8.4. Actually, you have been lucky enough to avoid the accidental data wiping in the process of iOS 8.4 updating, because data lost during the updating process cannot be recovered from the iPhone or iPad at all. While if you lose call history only after you have updated to the latest iOS 8.4, it is not only possible to recover the lost call history from your iOS 8.4 iPhone or iPad but also recover the lost call history selectively. You can achieve so with a piece of magic third party software iFonebox. This professional iOS data recovery software can recover not only call history but also contacts, notes, messages, reminders, and whatsapp etc from your iPhone or iPad running iOS 8.4 but also from iTunes or iCloud. You can firstly download a free trial version to have a try but you need to pay for the full version with registration code. Next I am going to demonstrate how to recover the lost or deleted call histoty from iOS 8.4 iPhone or iPad selectively. Step 1: Connect your iPhone or iPad to your computer at first. Install and launch the full version of iFonebox. After your iOS 8.4 iPhone or iPad being detected, hit the button of “Start”. You have successfully chosen the recovery mode of “Recover from iOS Device”. 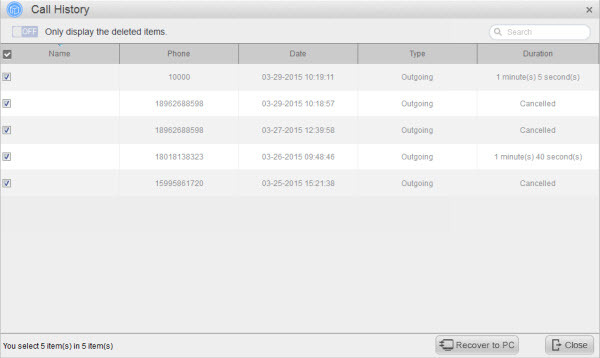 Note: The current verison of iFonebox only supports recover the lost or deleted Call History item from iOS 8.4 iPhone or iPad to computer for convenient checking.